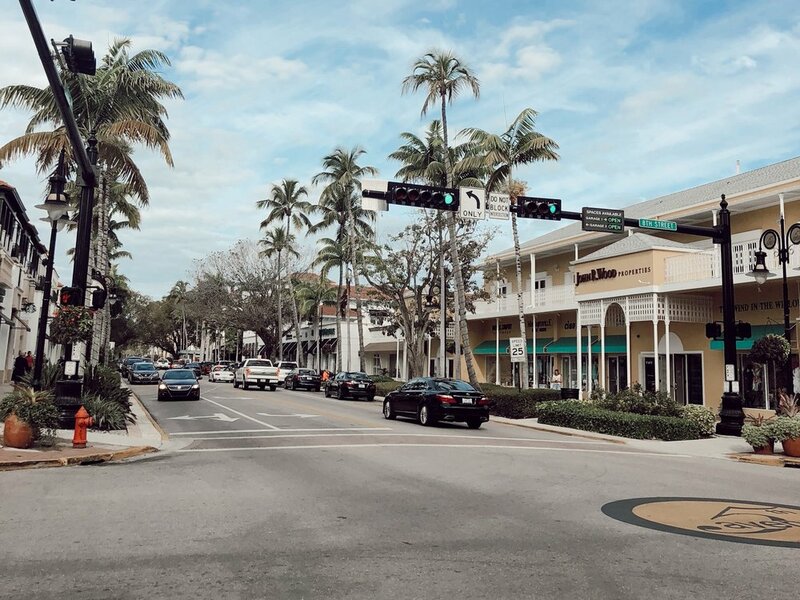 My family has had a place in Naples, Florida since even before I was born and it’s quickly become my second home over the years. Naples is known for its white sandy beaches, calm blue water, and its’ money. Naples sits in the southwest part of Florida, known as Paradise Coast, pretty much as south as you can get besides the Florida Keys. We love the entire Paradise Coast area: Marco Island, Ft. Meyers, Bonita Sprints, Sanibel Island, and of course Naples. Naples is more than just a vacation spot, it’s a place that I feel at home and where I can fully relax. We recently just got back from a weeklong-trip-that turned-into-two with some friends and family. I got some requests on a travel guide for Naples while I was down there, so I’m breaking down my top picks and recommendations by places to stay, food, bars/nightlife, shopping and fun things to do. I’ve even marked the most insta-worthy hot-spots with a * so you guys know exactly where to go first to hit those angles. If you’re planning a trip to Naples or want to see what it’s all about definitely give this guide a looksie and see how special Naples really is, hopefully you’ll find it helpful! Even though my grandparents have a house here, things get so hectic, so we always stay at the *Naples Bay Resort in the cottages. I love how spacious and private the resort is. The main building overlooks the harbor and the restaurants/stores, while the cottages overlook the pool. The resort truly feels like an all-inclusive with several food/dinning options, as well as activities, and it even has a lazy river! We’ve also stayed at the Edgewater Beach Hotel on Gulf Shore, which is a bit farther from downtown naples but is a gorgeous beach front street lines with luxury homes and hotels. The Hyatt House, Bellasera and Cove Inn are also some of my favorite places to stay if you’re looking to be a bit closer to downtown. This is one of the main streets in Naples and it’s one of my favorites, day or night. I love how the palm tree’s line the street and are lit up year round with lights. Some of my favorite restaurants and bars are on this street, along with a bunch of other cute boutique stores, gift shops and food options. This street is perfect for insta opportunities and You can almost always spot an expensive Bentley or Rolls Royce on this street. A few streets from Fifth Ave is Tin City, an open-air market with shops and restaurants. It’s one of my favorite places for souvenirs and gift shopping. This is a newer strip center about 15-20 mins from downtown Naples. It’s home to Designer Diva’s and True Fashionista’s, two of my favorite thrift stores to hit when I’m in town. They both carry designer goods, but if you’re looking for more high end shoes/bags (Gucci, LV, Channel) head to True Fashionista’s. Designer Diva’s has more clothing items/jewelry, but definitely give both stores a looks as I always find great pieces at both! Coconut Point is a huge outdoor mall with just about every shop. I would say if you are a person who wanted your everyday stores go to Coconut Pointe. Grab a juice or green smoothes at Delicious Raw Kitchen Juice Bar if you get the chance! The TJ Maxx here is one of my favorites! This is more of a designer, outdoor mall. I love all of the shops here and it really is a beautiful mall, perfect for insta opportunities. I mainly go shopping at Waterside for Nordstrom, Anthropologie, Free People, and Barnes and Noble. I would highly recommend eating at Tru Food for lunch and Brio for dinner. This is another large mall with just about every store. I don’t normally go to this mall as much because it is the furthest away from us. It is closer to Ft. Meyers area. This area is super young and hip both during the day and at night. Weekends are definitely more crowded, but theres a decent bar scene every night of the week. We typically stayed at Blue Martini and Cavo, but theres a bunch more that Mercato has to offer that we didn’t explore. Mercato is about 15 mins from Downtown Naples so be prepared to have a ride or catch an Uber. Blue Martini is fun every night but especially on weekend and wednesdays for Ladies Night. It’s your typical restaunt-by-day and bar-by-night. They have live music until around 11/11:30 and then a DJ which plays top 20/house music and they do have bottle service/vip areas but its definitely not needed. Cavo is right across the sidewalk from Blue Martini. We used this as a fun pregame spot, It’s a covered bar with open sides, and they have a dance floor and a DJ who played good music so I can imagine it gets pretty good in here on some nights, just wasn’t super crowded when I was there. Naples has so much more to offer than its beautiful beaches and fresh seafood. Here are some of my favorite things to do in and around Naples! *Celebration Park : An insta-worthy outdoor bar and hangout spot on a canal, complete with food trucks and giant jenga. *Head to watch the sunset at Naples Beach Pier : One of Naples best spots to watch the Sunset or head to the beach! If you go to Naples and visit any of these places, be sure to tag me in your pics and let me know what your favorites are!